In the 1980’s pinball manufacturers searched desperately for ways to stay relevant to a public that increasingly chose videogames over their mechanical cousins. After bankruptcies and consolidation, the industry settled on licensing movie and TV show trademarks as their path forward. But in the early ‘80s, they were still trying to be creative. The mechanics of the game were simple and twitchy. The playfield had a number of “target” flaps with letters in front of them. Red lightning-bolt shaped lights stretched from the targets down to your cannon. As the game went on, the lights illuminated, one by one, marching downward in columns. If you shot a ball into the flap or hole associated with a column, the bottom most light went out; the effect was as if you were “beating back” the lights. If a lightning bolt reached the bottom of the playfield, you lost a life. I’m simplifying the game a bit – you also had smart bombs, for example, which destroyed everything on the playfield – but that’s the basic idea. The gun was not fully automatic, and had two triggers, once for each hand. You had to pull a trigger for each ball fired. The gun could be fired at a faster rate than you could pull the triggers, so this led to all sorts of odd “chording” finger patterns on the triggers which could induce terminal carpal tunnel syndrome in about 10 minutes. 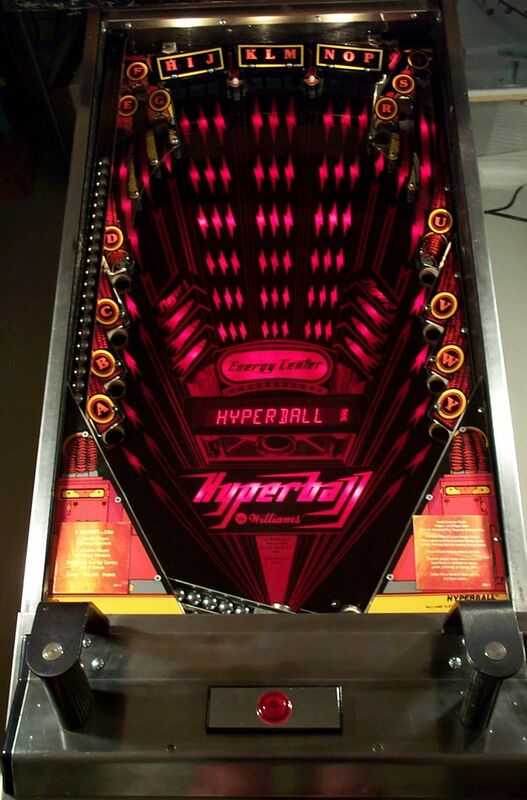 Hyperball was designed by Steve Ritchie, who designed a number of games, including the classic (or infamous, depending on your taste) Black Knight. Hyperball occupied a strange niche, and it showed. It wasn’t videogame enough to draw in videogame players with regularity, and it wasn’t pinball enough to draw in pinball players either. I tried it a couple of times to slake my curiosity, and then left it alone, saving my quarters for other, more traditional machines. Because of the tremendous beating each game exerts on the chassis and mechanical components, there aren’t too many of them left in good working condition. There’s another nice writeup of Hyperball maintained by a fan. Excerpts from “Hyperballad” by Bjork used without permission.